Pasithea Travel Footrest allows you to further enjoy your flight by giving you the ability rest your feet at any height along your journey. Our footrest provides unmatched comfort to anyone who needs to let their feet rest along the journey. 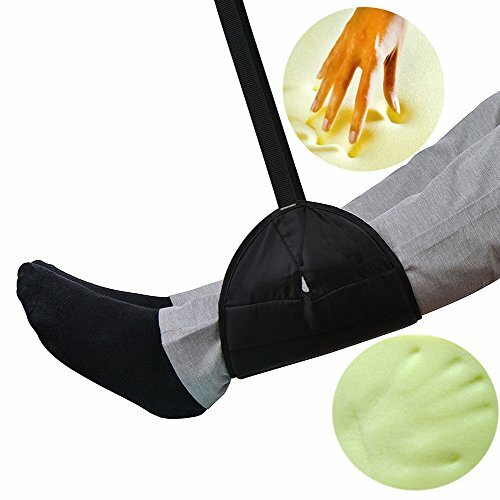 Significantly reduces lower back stress and prevents swelling and pain in your feet. Relax with the most comfortable memory foam and the latest footrest design. Simply hang the footrest around the arms of the tray table and relax your calves or feet inside. Find the perfect length to provide the most comfort and support with the adjustable strap. Perfect for anyone 5’ 8” or shorter. Excellent for children who need to rest and nap along the flight. Can be used when the tray table is both up and down. Get your work done in a comfortable and relaxing manner. Our footrest can easily mount to your desk with the assistance of two small buckles. The drawstring-bag allows for easy storage and travel so you can create a hammock-like experience wherever you go! No Risk with a 100% Money Back Guarantee. TRAVEL WITH COMFORT - Experience the comfort of the newest footrest design with premium thick memory foam that provides long lasting relaxation and relief. EASY TO USE - Strap the footrest around the tray table and you're all set! The adjustable strap allows for individually modified support and comfort. Relax with the tray table up or down. NO MORE SWOLLEN FEET! - Our thick and plush memory foam provides your feet with the comfort and care they need. No more painful swelling, stiffness or discomfort on long flights. Arrive at your destination feeling refreshed and revitalized! PERFECT CARRY ON - Specifically designed for your carry on luggage. Comes with a drawstring bag for easy storage and organization. Lightweight and compact makes for easy travels. UNIVERSAL - Our newly designed footrest is not only perfect for the family vacation or business trip, you can also rest your feet on clouds in the office, at your home desk, and even on the bus and train. If you have any questions about this product by Pasithea, contact us by completing and submitting the form below. If you are looking for a specif part number, please include it with your message.